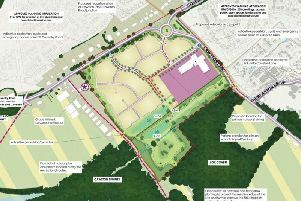 A Government planning inspector has given residents’ group Stop Ashlawn Road Development (SARD) full rights when a public inquiry takes place into the Ashlawn Fields development. SARD will now be able to call its own witnesses and cross examine those put forward by David Wilson Homes. The planning inspector has yet to set a date for the inquiry but SARD chair Bill Lewis, pictured here with some of the committee members, said: “The borough council was right to reject this scheme because of the traffic it would generate and the impact this would have on air quality in Dunchurch. SARD’s next challenge will come with the publication of the next version of the borough council’s development plan next month. “I hope the council will have dropped its proposal to build on Ashlawn Fields,” said Cllr Lewis.